I am in my late 30s and now living in Massachusetts where I grew up. I was a middle child of five in a very close family. When we were really young, my two younger sisters and I were always fascinated with the unknown. We would look in the obituaries in the newspaper to see who had recently passed away and we would have séances in our garage with some other local neighborhood kids. Usually nothing would happen, but a couple of times some weird things happened that we just could not explain. 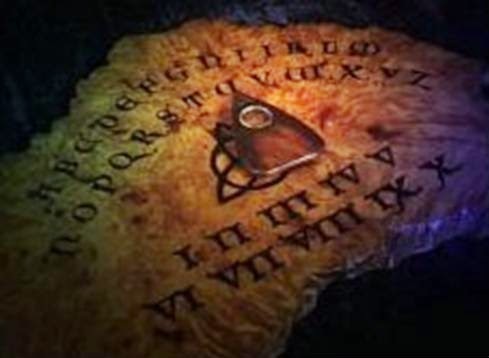 When my sisters and I were in high school, we learned about Ouija boards. We bought one and began to play with it. Two of us would get on it and the other would write everything down. At first it was fun. We talked to several different spirits that told us where they were from and about their families, etc. This went on for weeks, then gradually things started getting a little scary. Eventually, every time we got on the board, the same spirit would come on, who was not very nice. He told us he was the devil and he was going to get us somehow. He called him self "Zozo." When a friend of ours confronted our priest about this name, he got very angry and told us we should not be playing with Ouija boards; they were not toys and we could get into trouble. He gave his Sunday sermon on the subject. Needless to say, we stopped playing with it. Then, while still in high school, one of my sister's best friends lost her sister in a van accident. She and her sister were very close. She knew of our adventures with our Ouija board and begged my sister to let her come over and use it to talk to her deceased sister. Hesitantly, my sister sat down with her and contacted her sister with the board. Her friend bawled and told her sister how much she loved her and missed her. She didn't want to live anymore without her and wished she could be with her. About two weeks later, my sister's friend died... in a van accident - exactly the way that her sister had died. My sister took the Ouija board and put it out with the trash, and none of us has touched one since.